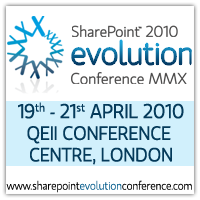 Andrew Connell - Looking forward to the SharePoint 2010 Evolution Conference in London, just over a week away! What's new with Web Content management in SharePoint Server 2010In this session attendees will learn what improvements Microsoft added to SharePoint Server 2010 for hosting content-centric sites including one-click authoring, leveraging metadata, improvements to the Content Query Web Part and event the new Web Analytics service for monitoring the status, health and activity of a content-centric site in SharePoint Server 2010. 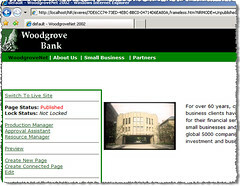 Upgrading and Improving SharePoint 2007 WCM sites to SharePoint Server 2010 WCMSharePoint 2010 delivers a rich new environment for managing and authoring web content, along with a wide range of platform improvements. 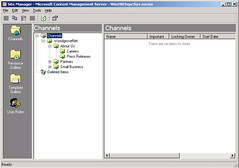 In this session, we will demonstrate a live upgrade of a SharePoint site from SharePoint 2007 to SharePoint 2010. Along the way, we will discuss key upgrade considerations, review the changes required to implement the fluent UI for content authoring and show how to enable new features like video streaming, tagging, ratings and wikis in a publishing scenario. I'm also going to be participating in the keynote which I'm really looking forward to! I won't be in London for very long on this trip. The week before I'll be in Norway teaching a class for a client so I'll be flying in on Saturday and back home on Wednesday. On Sunday I'm really looking forward to a visit to the Imperial War Museum. Oh yeah, I almost forgot: SharePint! If you're in the area, make sure you join us at SharePoint by Day, SharePint by Night on Monday night, April 19th at the Old Star Pub Westminster. Now, back to getting these demos together. Check out what I'm working on right now. Anyone recognize these throwbacks? Yeah? Anyone? :) Bringing the VM where I had these guys setup, a Virtual Server VM, was no easy task. Forcefully ripping the Virtual Machine Additions off the machine, then the fun of trying to get the Hyper-V Integration Services installed without mouse support for about 20 minutes was loads of fun. Then I had to dig WAY back to remember how to login & what accounts I used when I set it up!